Vital Insurance Agency, an Illinois-based insurance and financial planning firm that provides coverage to businesses and families throughout the greater Chicago region, is teaming up with the Southwest Suburban Immigrant Project for a charity initiative aimed at supporting immigrants in the Chicago area. 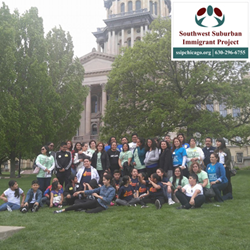 The Southwest Suburban Immigrant Project is a nonprofit group dedicated to supporting immigrant communities in the suburbs of southwestern Chicago. Through ongoing education, peaceful advocacy, and direct civic engagement, SSIP works to assist immigrants in acquiring the proper documentation, learning their rights, and integrating with the Chicago community. “We are a nation of immigrants, and I believe every person, no matter where they are from, deserves a chance to work toward the American dream and live a peaceful, productive life,” says Miguel Gonzalez, founder and director of Vital Insurance Agency. To find support among families, business owners, and activists throughout Chicago and the state of Illinois, Gonzalez and his team are utilizing social media and email to share information about the Southwest Suburban Immigrant Project charity event. The Vital Insurance team is in the process of producing a feature article discussing the charity drive for publication in the next edition of the firm’s online community interest magazine “Our Hometown”: http://www.vitalinsuranceagency.com/Our-Hometown-Magazine_39. In spring of this year, Vital Insurance Agency became a member of the nationwide charity involvement campaign “Agents of Change.” As such, Gonzalez and his team will be seeking out and working with a new Chicago-area charitable cause or nonprofit organization every sixty days. Readers that want to take action in support of the charity drive to assist the Southwest Suburban Immigrant Project are encouraged by the Vital Insurance team to visit this page and make a personal effort to further the cause: http://www.vitalinsuranceagency.com/Guiding-those-pursuing-the-American-Dream_13_community_cause. For those who wish to track the involvement of Vital Insurance Agency as they support more charitable causes in the future, a current list of the firm’s Community Causes can be found here: http://www.vitalinsuranceagency.com/community-cause. As a lifelong native of Bolingbrook, Illinois, agency owner Miguel Gonzalez knows many local families. His knowledge and understanding of the people in his community ensures that Vital Insurance Agency clients are provided with an outstanding level of service. Miguel and his team look forward to helping families protect the things that are most important - family, home, car and more. Vital Insurance Agency also offers clients a preparation strategy for achieving their financial goals. To contact an expert at Vital Insurance, visit http://www.vitalinsuranceagency.com/ or call (630) 771-9000.